2 Richtlijn Diagnostiek en Behandeling van Pijn bij Patiënten met Kanker; modulaire herziening, publicatie 2016. 5 Van den Beuken-van Everdingen MHJ, de Rijke JM, etal. Prevalence of pain in patients with cancer: a systematic review of the past 40 years. Ann Oncol. 2007;18(9):1437-1449. 8 Reddy S.K. & Nguyen P. Breakthrough pain in cancer patients: new therapeutic approaches to an old challenge. Curr Rev Pain 4, 242-247 (2000). 9 Zeppetella G. Breakthrough pain. In: Oxford Textbook of Palliative Medicine, Fourth Edition,654-661 (2010). 10 Davies A., et al. Multi-centre European study of breakthrough cancer pain: pain characteristics and patient perceptions of current and potential management strategies. Eur J Pain 15, 756-763 (2011). 11 Zeppetella G. Breakthrough pain in cancer patients. Clin Oncol (R Coll Radiol) 23, 393-398 (2011). 12 Schneider G., et al. Cancer Pain Management and Bone Metastases: An Update for the Clinician. Breast Care (Basel). 2012 Apr;7(2):113-120. Epub 2012 Apr 27. 13 Gomez-Batiste X et al. 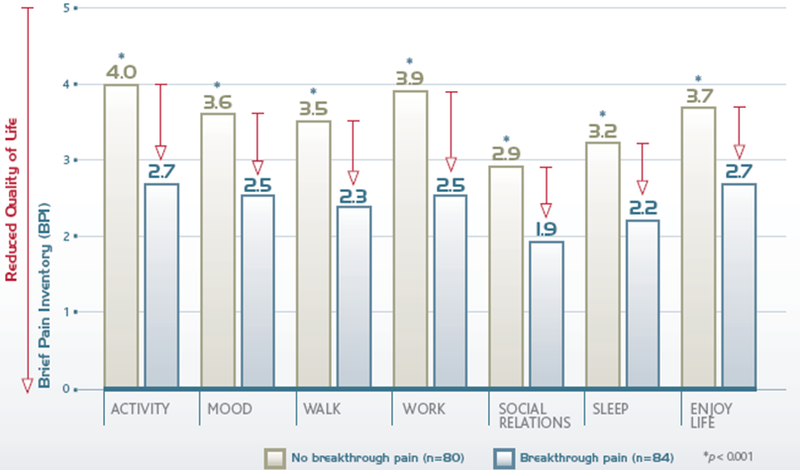 Breakthrough cancer pain: prevalence and characteristics in patients in Catalonia, Spain. J Pain Symptom Manage. 2002;24(1):45-52. 17 Fortner BV et al. 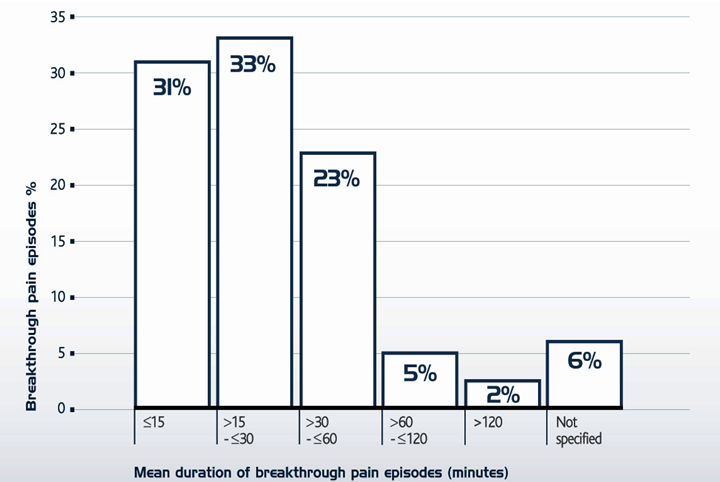 A survey of pain-related hospitalizations, emergency department visits, and physician office visits reported by cancer patients with and without history of breakthrough pain. J Pain. 2002;3(1):38-44. 18 Fortner B.V., et al. Description and predictors of direct and indirect costs of pain reported by cancer patients. J Pain Symptom Manage 25, 9-18 (2003).